Aside from the great quality of living in Des Moines with good jobs and great schools, there are also parks and trails for miles for people of all ages to enjoy. Whether you enjoy long walks, wide open bike rides, or just nature at its finest, Des Moines has a trail for you. The Central Iowa Trail Association boasts multiple trails throughout the metro on top of the miles of trails owned and maintained by the city of Des Moines. As one of the premiere areas west of downtown Des Moines, West Des Moines has a wide array of parks and open spaces for your enjoyment. The Jordan Creek Trail traverses through neighborhoods of single-family homes and apartments, following EP True Parkway for most of its distance. One of the highlights of this trail is its access to one of the best parks in all of Des Moines, Raccoon River Park. At over 600 acres, the park has a soccer complex, softball fields, dog park, picnic shelters, and a lake! And this trail brings you to it all! 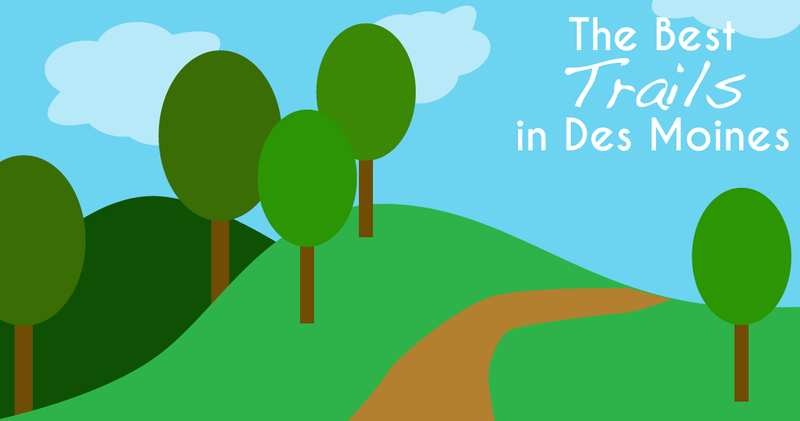 This trail is not a singular journey as this trail has other trails connected to it, giving you a beautiful journey through West Des Moines. At almost 20 years old, the Inter-Urban Trail lives up to its name as it connects people to nature via the abandoned tracks of the Urbandale streetcar line. The Wakonsa Bridge takes walkers and bike riders over the Des Moines River in one of the more picturesque parts of the trail. The Inter-Urban Trail is connected to many other trail arteries providing access to Big Creek State Park and the Saylorville area as well as downtown Des Moines. In addition, this trail is connected to the ever-popular Trestle to Trestle Trail (see below). Living up to its name, this trail goes from urban to nature and back again. The Inter-Urban Trail goes straight through the wooded Beaverdale Park and eventually ending in the historic and beautiful Beaverdale neighborhood of Des Moines. Along the northern bank of Walnut Creek you will find the Clive Greenbelt Trail. This trail, winding through Des Moines suburbs of Windsor Heights and Clive, offers bikers and runners alike winding trails and beautiful views. One reviewer stated: We enjoyed riding the Clive Greenbelt Trail a couple of days ago. Three deer greeted us and followed us for a short time while we were walking our bikes in a dirt detour area where city employees were trimming some trees. Because of the high volume of trees on this trail, there are immense colors in the autumn. This trail also connects with the Raccoon River Valley Trail on the western end. Connecting one of the most popular Des Moines suburbs with the metro, the Trestle to Trestle Trail is a 3.7 mile, ten-foot wide asphalt trail connecting the Inter-Urban Trestle Bridge with the Trestle Bridge. This trail also goes through the Beaverdale neighborhood and connects with the restored railroad trestle which spans the beautiful Des Moines River. Winding through heavily wooded areas and open expanses, the Trestle to Trestle Trail offers something for everyone and is a bright spot for Johnston and its residents. If you are still wondering if one of these communities is the right place for you - Space Simply is ready to answer your questions! Connect with us online or at (515) 423-0899 to discover how you can list your home with Space Simply and avoid the expensive fees and commissions associated with traditional real estate agents.